Long serving hospital volunteer Dolores ready to help. PCH volunteers play an extremely important role in making sure patients and families have a positive hospital stay or visit. Volunteers add the most important of all ingredients to the hospital – love, empathy and the ability to create an atmosphere of friendliness and goodwill. Our dedicated volunteers contribute to the wellbeing of children and young people and commit their expertise and time to the running of the hospital in ‘behind-the-scenes’ jobs and in support roles for patients and families. 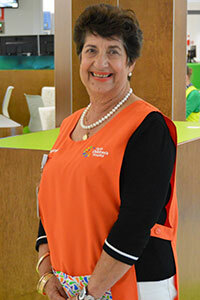 Our volunteers are easy to spot in their tangerine tops and are happy to help at any time. To apply to become a PCH volunteer, please complete an application form and email it to PCH Coordinator Volunteer Services.